The rainbow of clay colors available reflects the variety of minerals a given clay may contain, depending on the soil composition of the area from which it was mined. All clays will draw oil from the skin, though some have stronger drawing abilities than others. For instance, those who tend to have drier skin may find that white cosmetic clay is preferable. People with oilier skin, on the other hand, might choose a Fuller's earth clay. 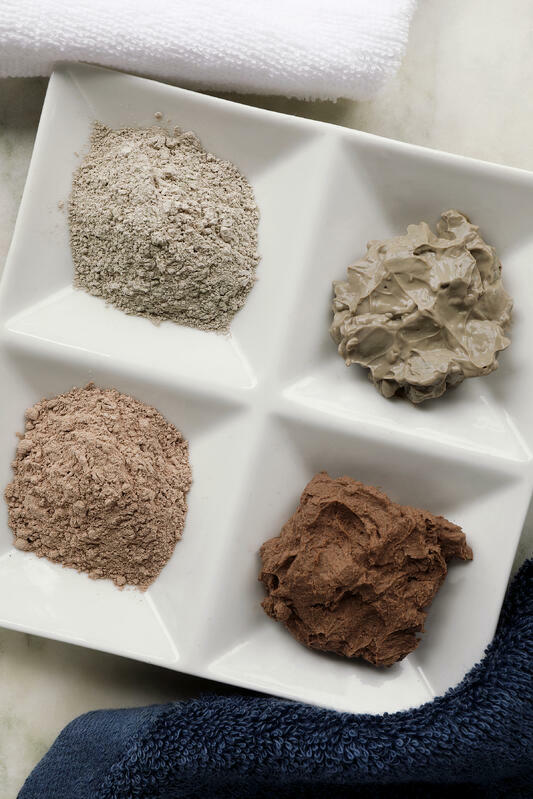 Cosmetic clays are commonly used in facial masks, and using a hydrosol in place of water when creating a mask paste is a simple way to add skin-supporting botanicals into the mix. 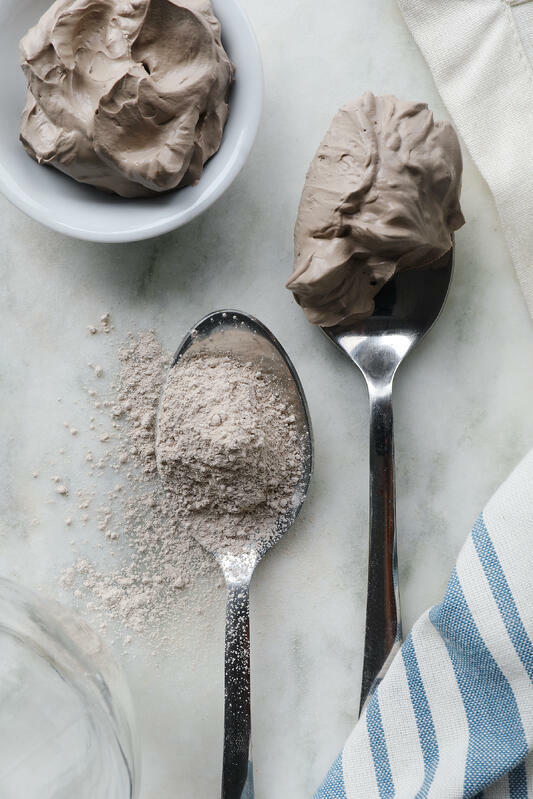 Clays can be incorporated into DIY soaps, dry shampoos, and even homemade baby powder. They can also be added to the bath for a mineral-infused soak. And they’re not just for skin care! Bentonite clay and Fuller's earth clay are great to keep around the house for cleaning up oily messes on carpets and clothing. Bentonite clay is composed of volcanic ash sediments that have been weathered over a long period of time. Sodium bentonite clay is known for its swelling properties, as it acts like a sponge when mixed with water. This clay is very popular for facial masks, foot baths, or bath soaking blends. Dry Characteristics: The dry clay has a neutral scent and a pale, off-white color. The texture is slightly grainy, but it smooths out when pressed between the fingers. While it does leave something of a powdery coating behind when brushed off, the dry clay doesn’t stick to skin too much. Wet Characteristics: When wet, the clay paste is off-white in color with a smooth consistency. If liquid is added in too slowly, clumps will form, and the use of a whisk is helpful for keeping a smooth consistency. This wet clay spreads smoothly on skin, and its thick texture is reminiscent of cooked oatmeal. French green clay is so named because some of the first recorded deposits of this clay were found in France, although it is now known to be found in many different spots around the globe. This fine-textured clay takes its verdant color from decomposed plant matter. 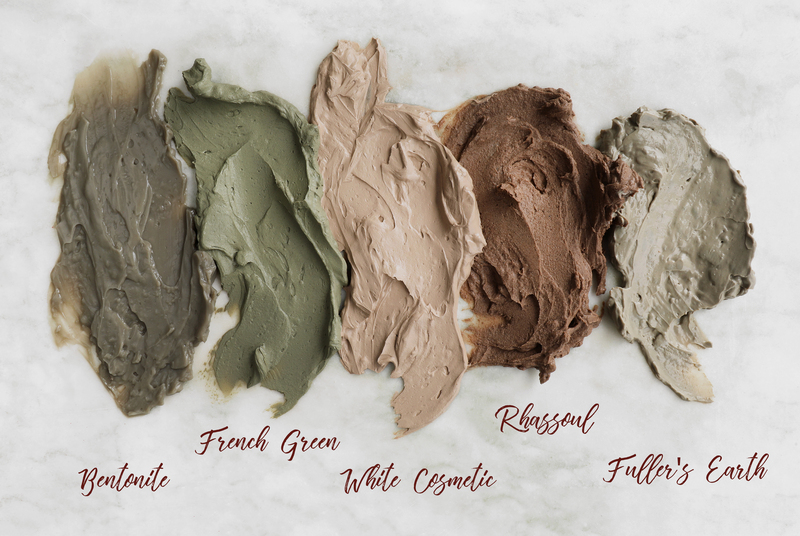 Many people find French green clay helpful for occasional blemishes, and it is generally used by those with average to oily skin. Dry Characteristics: French green clay has a neutral earthy aroma and pale green color. This clay doesn’t “puff” (create a cloud of fine mist) out of the bag and has a fine texture, with a slight graininess. Wet Characteristics: When water is added, the paste of this clay tends to have a slight lumpiness. Be sure to mix slowly and thoroughly with a whisk when adding liquid for smoother clay preparations. This clay has a somewhat darker green hue when moistened than in its dry form. The texture has a tendency to be a bit grainy when applied to the skin and is similar to the Rhassoul clay in consistency. Fuller’s earth clay has very strong oil absorbing abilities, and because of this, it is recommended for those with very oily skin. This clay is also helpful in stain removal and has mild natural bleaching properties. Dry Characteristics: The dry clay has a lightly earthy scent and an off-white to greenish and tan color. The texture is fine and powdery. It is also very lightweight, so watch out, it can get everywhere! Wet Characteristics: Fuller’s earth clay is very smooth and easy to mix with liquids. The color is dark grey to dark tan, and it retains a fairly thick consistency when wet. Rhassoul clay is a fine, red-colored clay from Morocco that has been used for centuries in the realm of natural skin care. 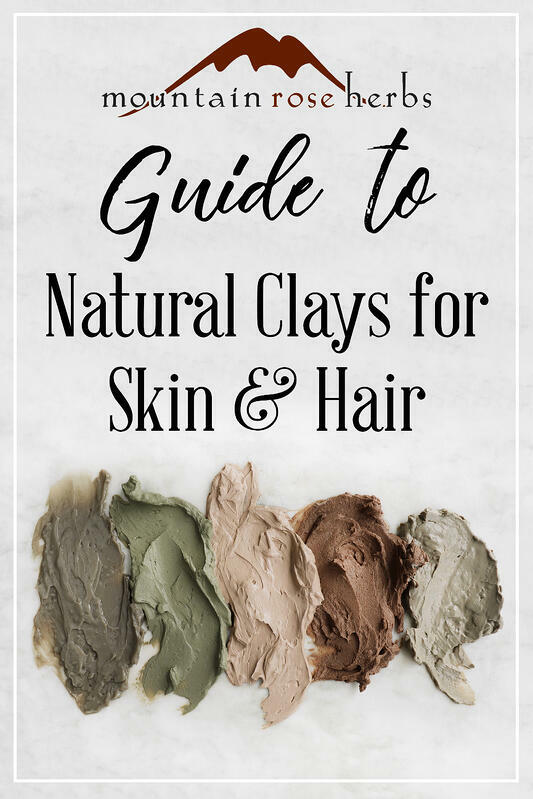 While it will still absorb oils from the skin, it is much gentler than many other clays and is typically recommended for more sensitive or mature skin types. Dry Characteristics: When dry, this clay has a light reddish-brown color and a fine texture; its slight grain feels similar to French green clay. However, unlike French clay, its lightness gives it a tendency to slightly puff out of an opened bag. Wet Characteristics: This clay mixes easily into water to create a darker, red-brown colored paste without lumps. It still retains a slight graininess, though this goes away as the clay absorbs water. It's easy to smooth onto skin and has a thin consistency when spread out. White cosmetic clay (aka Kaolin clay), is not as absorbent as other clays, making it appropriate for skin that tends to be drier or more sensitive. 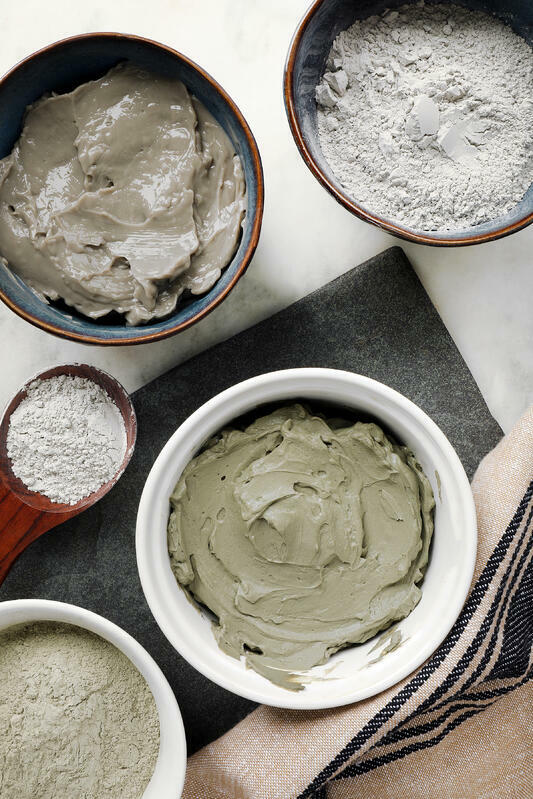 Often, this clay is found as an ingredient in mineral makeup. Dry Characteristics: This clay has a neutral scent with a light tan color that can vary to off-white. The texture is very fine and soft, and it will coat skin with a thin powdery layer when handled. Wet Characteristics: When liquid is added, this clay takes on a much darker tan color. The texture remains fine and mixes easily with water, and it is smooth and grit-free. There are an endless number of ways in which to use cosmetic clays, and we encourage you to find your creative outlet! Interesting in trying a new face mask recipe ? 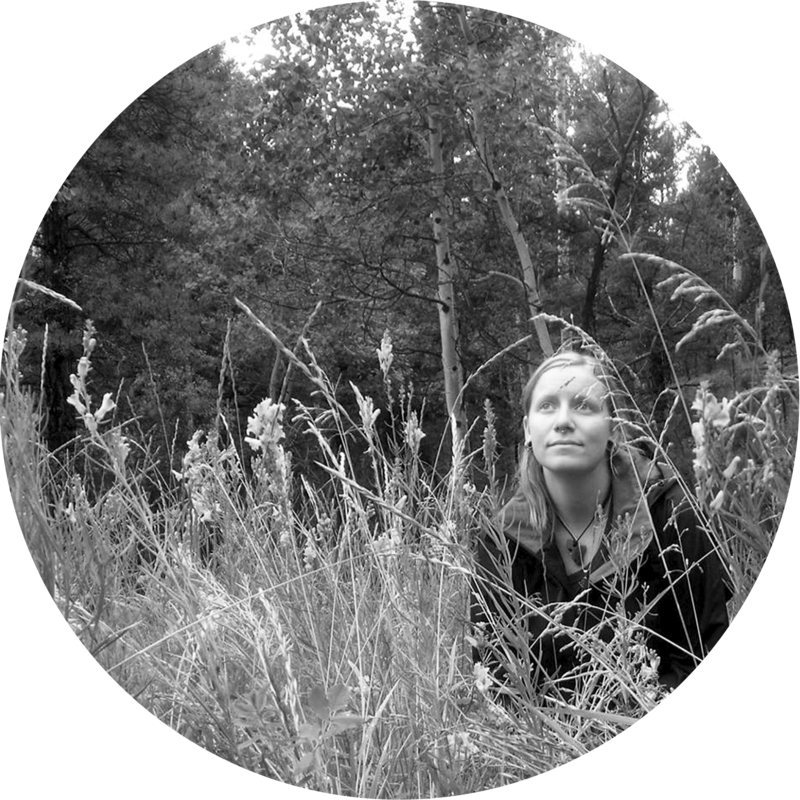 Check Out This Herbal Ayurvedic Face Mask!